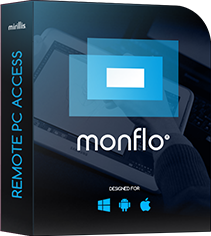 Monflo’s unique invitations system allows you to quickly send an invite to any user you want to connect to your computer, despite of the kind of device that invited person is using – both Android and Windows users can be invited. This tutorial will tell you how to create those invitations. Login to Monflo with your Monflo Account username and password. Click “Invite user” and type in a username of the person you want to invite to use your PC computer. Remember: the person who you want to invite using username must have a Monflo Account created or use Connection ID do invite the person. Tutorial on using Connection ID can be found here. When inviting a user you must choose the time for how long invited user will be able to access you server. Invited user log in on Client Application and must choose the server device from the list of devices. Active invitations tab is a place where we can see every device that you have invited to remotely use your computer and manage them. Here you can delete single or all invited devices that currently have access to your computer.